This First installment of my Port Forward Tutorial series, in this tutorial you get the basic knowledge about port forwarding what is use of port forward and how it almost beneficial for you, And how to configure port forward in home router for remote desktop sharing (3389) and how to access using Static IP provided by ISP (Internet Service Provider). Q: What is Port forwarding ? Port forwarding allows remote system from internet to connect to a specific computer or network service in Local-Area network. In the following image we can see how to take access of the home network using port forwarding. 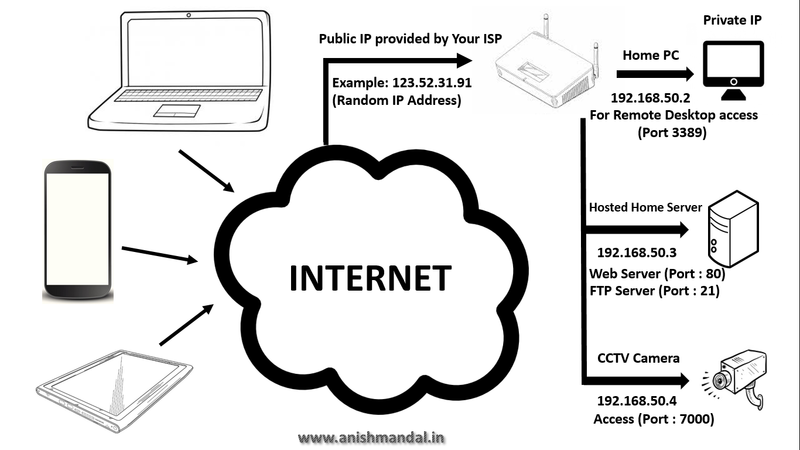 Identify IP Address (Public and Private) in Home Ethernet network. How to access WiFi router (internet router). 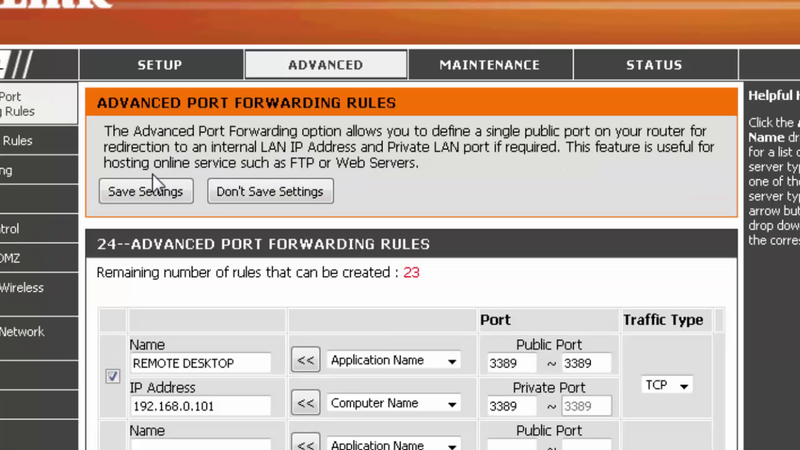 How to Configure Port Forward for Remote desktop (Port 3389) in Router. Take Remote Desktop of Home system from Internet computer using Static IP provided by ISP. So before we start we need to know little about IP address (Internet Protocol Address) and difference between them. Whats difference between Public IP and Private IP? Public IP is assign by your internet service provider. The range and record is maintain by our ISP. We cannot select Public IP address the range is defined by InterNIC that are guaranteed to be globally unique to the Internet. We can connect our LAN environment on single Public IP address for Internet access. IP Address which require the systems to communicate each other in LAN network. We can decide the IP Address | Range as per our requirement. Its divided in 3 class. Multiple Private IP Address can access internet using an single Public IP. When we get Internet connection from ISP we only concern about internet speed bandwidth plan for home but if we want we can ask for Static IP Address. What is Static IP Address ? Fixed IP Address Provided from ISP (Internet Service Provider). Whenever we access internet or browse web pages the static ip will be out. Internet Service provided is Charge Extra for Static IP internet connection. IP address can be directly accessible from internet. Now to Our Tutorial Part. To find out what is our Private IP Address in windows. In Command Prompt type Command: ipconfig (Hit Enter). The following (Image 1.0) we can see our Private IP Address 192.168.0.101. To find out Public IP. The page will display Public IP Address. How to access WiFi Router (Home Router) ? Now days every one use wifi router in home to connect multiple devices on home network for internet access, but most of people don't know the basic setting of wifi router or the IP address and access credential as the ISP provider or the system admins configure that router. But for this tutorial we require to take access of router and configure port forward in it i am using Dlink DIR-60SL router for this tutorial. To access the router we require to know ip address of that router and to find the ip address see the (Image 1.0) where default gateway is our router IP Address. Now in browser type Gateway IP Address in my case 192.168.0.1 Router will ask login credentials user name and password, most of time the login credentials is default provided by the vendor that can be found in user manual on the other hand we can see default username and password list on website (routerpasswords.com). Note : Before further changes its better to take backup of current router configuration. Most of our hard work is done now we can take the remote desktop connection of following system from anywhere over the internet simply using following steps. From Linux you can use freerdp client to connect. From Mac you need to download Microsoft RDP Client from microsoft website and same procedure need to follow which we applied in windows Remote desktop client. Now we can also access home system from IPad, IPhone or Android device all we need to download and install rdp client more info can found on freerdp website. The following tutorial can be watch in my youtube channel. In this video describe how you can solve sony Xperia series Phone reboot issue. © Anish Mandal. Awesome Inc. theme. Powered by Blogger.